by Sarah - May 26th, 2010. Filed under: New Products. 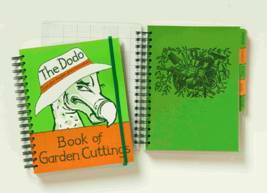 Tagged as: dodo book, garden diary, The Dodo book of Garden Cuttings. The Dodo Book of Garden Cuttings is one of the loveliest ideas I’ve seen in a long time! It fills that gap that all gardeners have for a way of recording what they’ve planted and where in the garden! It could be described as a diary but that’d be selling it short! The Dodo Book of Garden Cuttings is unique and very special! This diary style book goes beyond any diary I’ve ever seen in the level of practicality. There’s a wipe clean garden design page where you can scribble your garden plant layouts – and it’s on squared paper so you can do it to scale too! With proper pages to transfer the ideas you want to keep to this is a great way of designing your garden. All gardeners should keep a record of what they’ve planted when and where – in case the labels go missing. This book allows you to do that with ease and style. The cover is a tough plastic that’s got a elastic band style fastening which keeps everything safe inside. The pages are plain or squares and it’s packed with adorable cartoons, quotes and drawings. There are jokes and proverbs too. Each page turn is a real delight. In the diary section it’s split month by month with some months together – January and February and July and August are shared months! It’s a free form style diary – which in many ways works best for gardeners who may not need to write anything down each day, and conversely on some days will have many things to report! The dividers each has a wallet section in it for tucking in notes or seed packets. All gardeners will know just how useful this is! It will save you losing the packets that you need for growing instructions and harvesting details of all the plants you sow. You could even use this for keeping any magazine articles or newspaper clippings you want to keep – such as those local garden show reminders or planting help guides that many of the weekend papers have in. There’s even a note section at the back where you can write down the urls and phone numbers of all your gardening contacts and suppliers, as well as opening times of the local garden centre! Being spiral bound makes it easy to keep open at the right page – even if you’re sat outside in your garden writing in it! The layout and design of the dodo book is stunning. It’s very charming and enjoyable to flick through and read. Writing in it will be a pleasure each and every time – and it’s deserving of being written in with your best fountain pen, although pencil or a biro will do! 2. It’s beautiful. Seriously so – everyone who sees it will be wanting one for themselves! 3. Useful – fulfilling the needs of every gardener whether you love flowers or veggies. 4. Practical – not too big, and not too small – it’s perfect! 6. Loads of room for writing and drawing garden ideas! 7. Diary section – essential for keeping track of what you planted as well as making notes of what to do later in the year. 8. Spiral bound so you can tear out pages to share ideas with fellow gardeners! 9. Pages lie open flat enabling you to easily access any page within the book. 10. Guaranteed to make you smile! If the Dodo cartoons don’t tickle you, then the jokes and proverbs will! The Dodo Book of Garden Cuttings is priced at £17.95, and is available from a wide selection of book and gift shops, many garden centres and online at www.dodopad.com or mail order by calling 0845 053 1166. I believe this diary style cuttings book meets the needs of many gardeners and it will make a perfect birthday gift for each and every gardener you know! It’s also going to be something that can be a gift each year allowing the gardener to build a long term history of their gardening. Each day you’ll want to garden more knowing that you can then write in your lovely diary.